In college, Davenport rushed for 1477 yards on 369 carries (4.0 avg.) and caught 55 passes for another 532 and scored a total of 18 touchdowns. 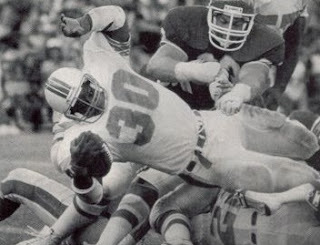 He was chosen by the Dolphins in the sixth round of the 1985 NFL draft and proved to be an outstanding short-yardage runner near the goal line and in third down situations. Dolphins went 12-4 to finish first in the AFC East. Won AFC Divisional playoff over Cleveland Browns (24-21). Lost AFC Championship to New England Patriots (31-14). Davenport spent another four seasons with the Dolphins, but his first remained his most productive. He ran for 314 yards in 1986 but with no rushing TDs and scored just two more in the remainder of his time with the club. He was utilized more as a receiver out of the backfield and achieved career highs with 30 receptions for 282 yards in 1988. Competing with FB Woody Bennett, a better pass blocker, and effective in spurts, Davenport was also inconsistent. Overall, he rushed for 1127 yards on 374 attempts (4.1 avg. ), caught 93 passes for 801 yards, and scored 17 touchdowns.